This is a great weekend to go whale watching, especially if you live near Monterey Bay. 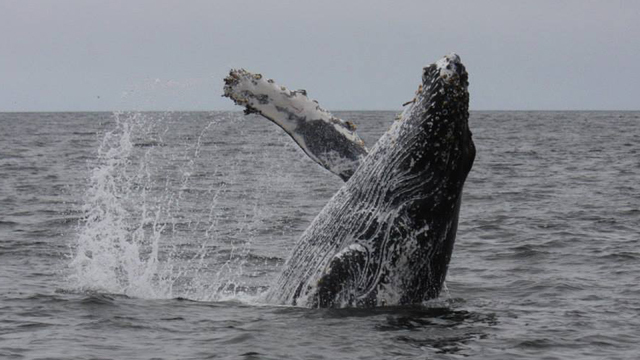 Local tour guides say they're seeing surprisingly large numbers of humpbacks offshore. “Right now there's record numbers of humpback whales feeding in Monterey Bay,” said Nancy Black, who's been leading whale-watching trips on Monterey Bay for 26 years. She said she's never seen anything like it. “It's been going on for over a week." There's a good reason for this: huge runs of anchovies. An explosion of anchovies means a feast not just for the whales, but for sea lions, brown pelicans and other birds. Black said she's seen blue whales, too, which is unusual for this time of year. Feeding Frenzy Fills Monterey Bay With Humpback WhalesBlack estimates that there are at least 250 whales in the Monterey Bay — more than she’s ever seen in her 26 years in the area. She and her crew are shooting photos of the whales’ tails, which are unique to each individual. They’re sending the photos to the Cascadia Research Collective in Washington state, which maintains a whale-tail ID catalog. 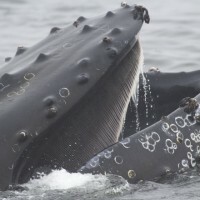 “I wouldn’t have been able to see this many whales when I started,” Black said, noting that the northeastern Pacific humpback whale population numbers have been increasing.No one know how long the whales will stay in the bay, or why the fish are so abundant this year. “It’s just incredible — the best whale watching ever,” Black said. Humpback whales spend the summer feeding off the California coast. Come November, they'll start migrating south, to Mexico. To see them you need a good pair of binoculars or to get out on a boat. If you're more the armchair whale-watching type, check out this humpback calf breaching.